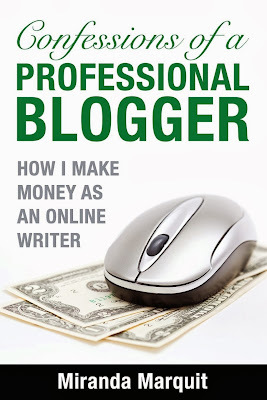 In the book, Confessions of a ProfessionalBlogger: How I Make Money as an Online Writer, Marquit shares her years of experience to encourage and support readers to begin their own freelance career. Unlike many ebooks, this ebook is a meaty 101 pages, and every chapter is packed with information. The old adage is to "write what you know," but Marquit instantly debunks this. Sometimes what you know isn't in a field where writers are in demand. Knowing how to do research so you can write about anything is far more important. In addition, Marquit examines the pros and cons of becoming a niche writer. If you have no writing leads and you need to make money fast, you can choose to write for content brokers like Demand Media and TextBroker. However, Marquit warns that while you'll earn money with these jobs, especially if you're a fast writer, they're not the type of samples you'll want to show most legitimate clients. Instead, she recommends starting your own blog and using your best posts as samples of your writing. While many tout sites like eLance as a way to get more experience, Marquit asks you to avoid bidding on jobs unless you're completely desperate because you'll often be working for less than minimum wage. Instead, she suggest you apply for jobs at job boards and gives a number of sites to start with. Another important step, according to Marquit, is to utilize Google Plus' profile page to be recognized as an authority author. Finally, she recommends encouraging clients to come to you and gives several strategies to make that happen. Marquit largely prefers to write for others. However, in this chapter, she explains many ways you can make money with your own blog and products. If you're looking to expand the money you can make working for yourself with your blog, this chapter is a must read. If you're blogging without making connections, your writing career will be slow to grow. Marquit confesses to being an introvert, but she makes an effort to get her name out there, and you should, too. This chapter is full of ways you can connect with others. Every day, more and more blogs are created. Those blogs need writers, which means now is an excellent time to be a freelance writer. However, there are other tasks to consider such as SEO, social media management, community manager, and editor, to name a few. While you can add these services on to your writing services, you don't have to. Know that you can also say no. Marquit acknowledges that people are writing the same stuff. The key is to make your writing stand out from the rest. While this chapter does contain some information about managing the flow of money coming in as a freelance, that isn't the bulk of the information in this chapter. Instead, Marquit writes about how to set your rates, how to negotiate a raise, and how to avoid being taken advantage of by clients who don't want to pay or try to add on work without increasing your pay. This is an important chapter for any freelancer. Part of the reason why Marquit can write so much content for so many clients is because she's a fast writer. She recommends writing, writing, writing to improve your writing speed. Writing within a particular niche also helps because you'll gain more basic knowledge through the years. She also details different routines to getting your work done. This chapter should be a must read for anyone who works from home. Because work is at home, it's easy to work more than you should and neglect your family and physical needs. Marquit has lived this way before, and it lead to serious burnout. She offers tips for managing a successful freelance career and maintaining your personal life as well as your health. If you aspire to be a freelance blogger or you already are but would like to ramp up your business, this book is definitely for you. However, even if you're not a freelance writer but you work from home, you'll likely find value in several of the chapters. At only $6.99, this book is worth the cost, especially if you're a writer. This line is true and real! "You Write a Lot of Crap When Money Is the Object"
When money is on your mind, your creative juices stop!